The American Meteor Society has received numerous reports regarding two large fireballs spotted over the North Eastern United States on the evening of May 1st. The first event happened around 9:30 EST and was seen from Illinois, New Hampshire, New Jersey, New York, Ohio, Ontario and Pennsylvania. Witness reports indicate the fireball occurred somewhere over North-Central New York. Below is a map of the witness reports and estimated fireball trajectory. Click the image to read the witness reports and view an interactive map for this event. 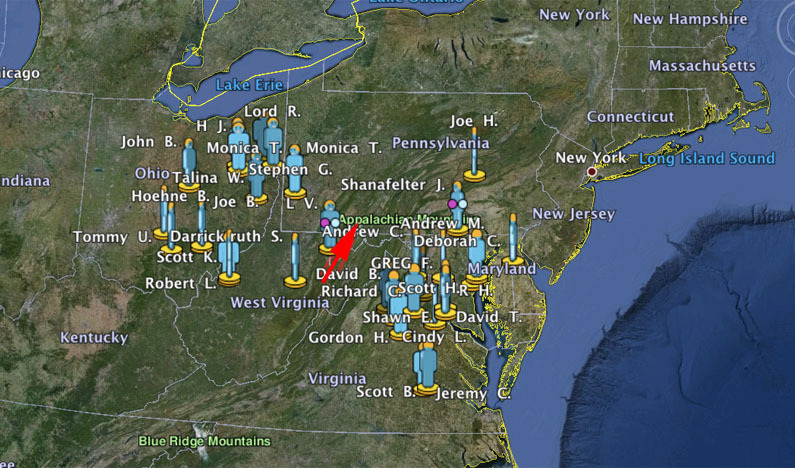 Two hours and fifteen minutes later at 11:45, witnesses from Delaware, Maryland, Ohio, Pennsylvania, Virginia and West Virginia reported a bright fireball meteor over central Pennsylvania. Below is a map of the witness reports and estimated trajectory for the second fireball event. If you witnessed either event please complete an official fireball report. On May 01, 2015 @ 21:30 PM, over the Kingston, New York skies, traveling from East to West a bright fire ball in the sky which was shooting off sparks, it appeared large in size from my distance it appeared the size of a small car, with a trailing flame of orange, red and white of a large length of my distance of 100 meters or more. It was traveling lower mid level in the sky as it descended to the horizon. Mark. I saw a fireball while on the East bound Pa turnpike mile marker 300 or so, at 3:10 am Saturday May 4th, 2013. It was headed north to south at a high rate of speed, smoke trail all around the object leading back for a 1/4 of the visible sky. Object was breaking up and throwing small burning chunks away from the main body. I saw a lot of mention of earlier events, thought I would say it continued into the night. I Saw a Meteor on Friday Night . I Live in Virginia in Buchanan County and it was a Little after 9:30 PM. The Meteor Appeared in the Sky in the East and headed toward the East it flamed up then turned a bright green color.